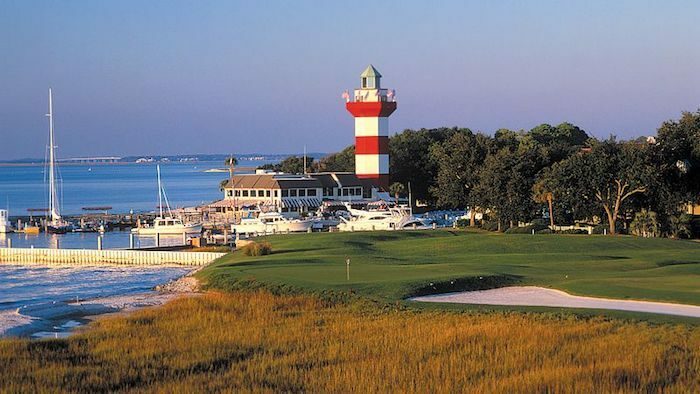 Hilton Head is a resort town on an island in South Carolina, 20 miles from Savannah and 95 miles from Charleston. With 12 miles of beachfront and two dozen golf courses, it is a popular vacation spot, attracting some 2.5 million visitors annually. The island has an interesting history: seasonally occupied by Native Americans thousands of years ago, site of several small plantations, and base for a Union blockade during the Civil War. Current “native islanders”, are descendants of freed slaves known as the Gullah, who settled on the island after the Civil War. Today, the island is mainly a vacation destination, where 70% of the tourists stay in some form of ‘gated community’. There are some great places to run in Hilton Head and area. The highlight is the 12 miles of continuous beach, which is very wide in spots and features firm, packed sand for most of the day and much of the day. Other great running spots are a loop incorporating the Cross Island Parkway Bridge, paths in Sea Forest Pines Preserve, and 14 miles of trails on Pinckney Island. Note that there are some 50 miles of bike paths on Hilton Head, and covering most of the major roads. 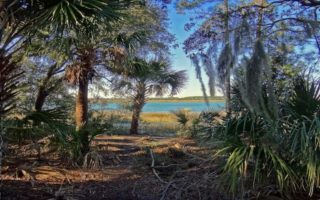 There are also some great spots for running near Hilton Head. We’ve developed routes for Pinckney Island, Palmetto Bluff, the lovely city of Beaufort, and Hunting Island. Note: Hilton Head Island is a beautiful place, but navigating it can be confusing. While many areas are free and open to the public, they can still be hard to find because of how the Island is set up. 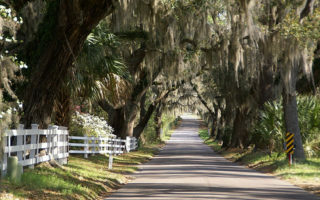 Much of Hilton Head is segmented into gated communities, also known as plantations. 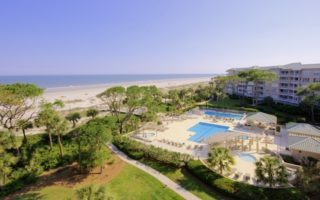 While some of them are private residential communities for people who live on the island year-round, there are others with resorts, golf courses, businesses and places to visit that are open to visitors — especially Sea Pines, Palmetto Dunes, and Wexford. One of the best beaches for running in the southeastern U.S. 11+ miles of continuous, flat & wide beach, much of it with reliably hard, packed sand. Beach itself is all public but with specific access points and parking spots. A good long run option in Hilton Head, this 12 mile loop incorporates the Cross Island Bridge, with great harbor and marsh views. There are bike lanes along nearly the entire run. Marshland Rd. offers a good canopy for those hot days. Resort occupies the southern third of Hilton Head. Combination of paved, hard sand, gravel, and grass trails. Miles of bike trails and 650 acre forest preserve. Great mix of marshes, boardwalks, canopy, and water views. $6 entry fee required for non-guests. Extensive resort between Shelter Cove and the beach, with numerous hotels. Lots of paths and quiet roads for running, including 5 miles of bike paths. Great to combine with a section along the beach. Island near Hilton Head with 14 miles of trails. Marsh views, lakes, dripping oaks, and wonderful birding opportunities. The main trail is 3.5 miles one way. 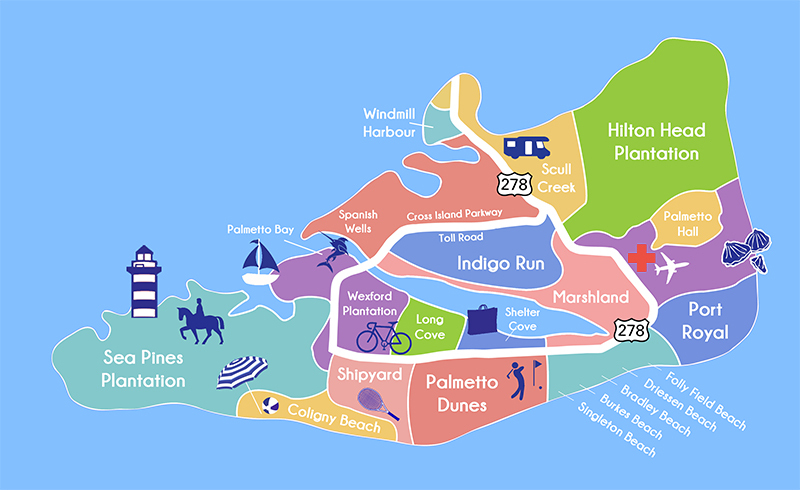 A combination residential community and resort area 20 miles of Hilton Head. Some 20 miles of gorgeous trails open to the public. Highly recommended is the River Rd. Trail, with woods, live oaks, views to the May River, and freshwater lagoons. A great tour of historic Beaufort, the second oldest city in South Carolina. 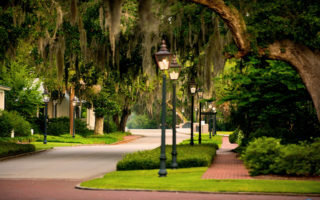 Enjoy two bridges, a moss canopied bike path, and Beaufort's historic area with its gorgeous homes. 5,000 acre state park on barrier island, 15 miles east of Beaufort. Lovely beach, and water related activities. Over 8 miles of recently renovated, relatively forested trails. Hilton Head climate ranges from mild to hot. The most pleasant seasons are spring and fall, when temperatures level off. Height of summer is hot and humid, with average July high temps near 90F (32C) and warm nights. Adjust your running schedule accordingly and make sure to hydrate. Winters are mild, with average January highs of 60F (16C) and cool nights, so bring layers. Temperatures occasionally fall below freezing. Also, summers can be rainy, with near daily downpours and thunderstorms. 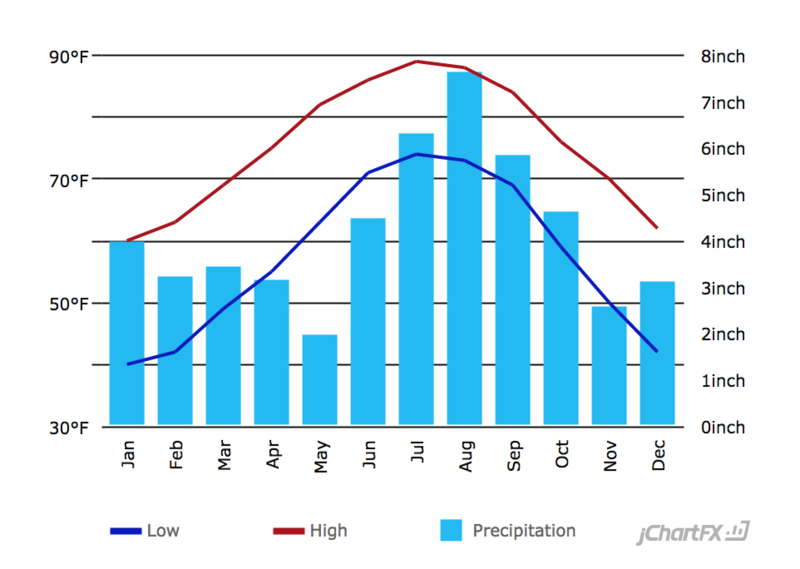 Winter months get half as much rain as summer. 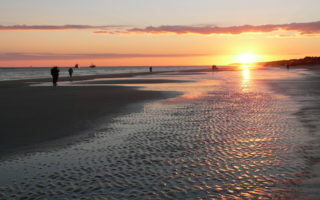 Hilton Head Island is primarily a resort community, so hotels are the ‘raison d’etre’ of the place. Many of the hotels are located within some of the plantations (gated communities). 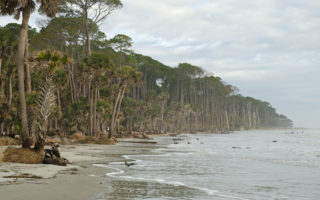 Some of them, like Sea Pines, are the community itself, while other plantations, such as Palmetto Dunes, host several hotels. There are clusters of hotels along the northern beach section of the island off Folly Field Rd. Another cluster a few miles south, in the Palmetto Dunes plantation stretching from Shelter Cove down to the beach, and several resorts in the Coligny Beach area. The southern third of the island is taken up by the Sea Pines resort. More budget friendly hotels will be found along Rt. 278, a mile or two inland from the beach. The main running store in the area is Palmetto Running Company. They have a location on island in Shelter Cove, and just off island in Bluffton. Great stores, and very helpful people. The Hilton Head store has group runs Saturdays at 8am during the winter months, and 7am during the summer months. Hilton Head Marathon & Half. Also an 8k. February. Palmetto Bluff Half. Also a 10k. March. Off island, about 20 miles east of Hilton Head. 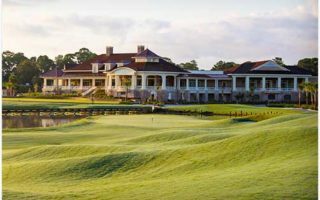 As the largest waterfront property on the East coast, Palmetto Bluff is evolving as a residential community and conservation preserve, with over 20,000 acres that remain virtually undisturbed. Buffalo Run. Event in the fall, with 10k, 30k, 50k distances, benefiting the Palmetto Bluff Conservancy.